Successfully Added Radio Control RC Toy Super Racing Car (110V) to your Shopping Cart. Radio Control RC Toy Super Racing Car for great fun indoors or outdoors! In the world of luxury supercars, this one certainly tops the list. It features a sleek, yet muscular design and comes in signature red to turn heads as it turns corners with precision. In addition, this remote controlled race car comes with elegant sport rims and low profile tires that display a multicolored light show while in motion. Drive forward and the front beams turn on. Reverse and the rear lights come to life making this RC vehicle perfect for day or night racing. The remote controller comes with a detachable 40 cm telescopic antenna for extra remote sensitivity and longer range. It also has 2 thumbsticks for true 8 directional movement based on the ability to steer forward, reverse, left and right. This makes a really great gift for any occasion, especially for racing car fans. As always, this wonderful new RC product is offered to you at a factory direct low wholesale price. From the leader in direct from China electronic products, Chinavasion. RC Toy Safety: This product should only be used by children under the supervision of an adult. Not suitable for children under the age of 8. Resellers are responsible for passing on safety advice to end customers and ensuring compliance with toy safety regulations in destination markets. Can this RC racing car be used outdoors? Yes. Can it be used outdoors after it has rained? It is not advisable as some water may get into the circuit system and damage the RC racing car. What is the wheel adjustment on the bottom of the racing car for? The wheel adjustment will help you straighten the front wheels, as time can cause wear and tear. 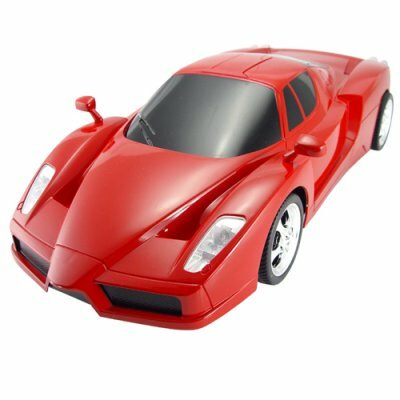 This way you get much more longer use out of this durable and amazing RC toy racing car for years to come.